There are different types of File System Format for USB Drive that affect the file size limit and compatibility of the USB drive on device. USB flash drive is becoming a popular wedding film delivery method to replace DVD and BluRay delivery. Formatting the right file system can increase the chance of successful viewing. Here's some of the popular file system formats. The same applies to formatting external portable USB harddrive. FAT (File Allocation Table) is certainly the defacto industry standard on consumer electronics. FAT32 is very popular comes pre-formatted in almost all USB flash drive. It has the most compatability on devices like SmartTV, smart phones, tablets, digital cameras etc. However, it has a file size limit up to 4GB per file. Apple developed HFS (Hierarchical File System) as Macintosh file system format. The format is also used in iPods. It does not have the 4GB file limit but the usage of HFS+ is very limited to Apple device. It does not work on Windows computer natively nor almost all consumer electronics. NTFS stands for New Technology File System. It is a proprietary file system developed by Microsoft but it has a high compatibility to consumer electronics next to FAT32. It also does not have the 4GB file limit. Macintosh can read NTFS volume but cannot write to it without third party software. There are several TV manufacturers licensed NTFS as one of the file system recognized through the USB port. FAT32 was an old file system architect that has gain wide popularity. But it becomes obsoleted with device with demanding storage capacity. Back in Windows 95 age, almost no files will be bigger than 4GB. However, with the popularity of videos and HD quality videos, files can easily be larger than 4GB. 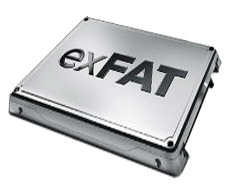 FAT64 or exFat (Extended File Allocation Table) is developed to replace FAT32. It breaks through the 4GB file limit and is gaining popularity on consumer electronic devices. However, it is still not as universal as FAT32 that is compatible in almost all devices. Which Format to Use for USB Flash Drive? Basically, for maximum consumer electronic playback compatibility, FAT32 is the must use format. Therefore, if you have video files over 4GB in size, it is better to break them down into chapters. It also makes it easier to navigate small file instead of fast forwarding in a long video. If you REALLY cannot break down the file to chapter, NTFS wiil be the next best choice. However, if you are using Macintosh, you might want to consider adding third party software such as NTFS for Mac by Paragon. Which Format to Use as most compatible to both PC and Mac? If you need to format a USB drive (or portable USB harddrive) for PC or Mac read/write, exFat would be the best choice as exFat is cross platform. However, older operating system like Windows XP natively will not read exFat formatted without update to SP2. In that case, format the drive in NTFS for Windows only access. However, Mac OS can only READ NTFS files but cannot write to it without adding third party softare. There were also reports on exFAT drive formatted on PC not using the "Default Allocation Unit" value that Mac OS will not mount the drive too. A TV with a USB port is just a regularly TV with a USB Port. They are not SmartTV. More and more TV now can playback videos on their USB port. However, it is up to the TV manufacturers to add that capability or not. Therefore, you cannot assume your client can view the film on the USB drive foramtted in FAT32 on their big screen TV. There're still many TVs (even new TV sets) still won't playback video files from their USB port. Our latest invention TakyBox HDMI TV Player powered by TakyBox HTML5 Menu System is a breakthrough method to watch films on any TV with HDMI Port 100% compatible. With the remote control, it can completely replace the need for DVD and BluRay for clients to watch their films on TV.